OFM Moon, Mesh Back Vinyl Office Chair [336-VAM] Free Shipping! 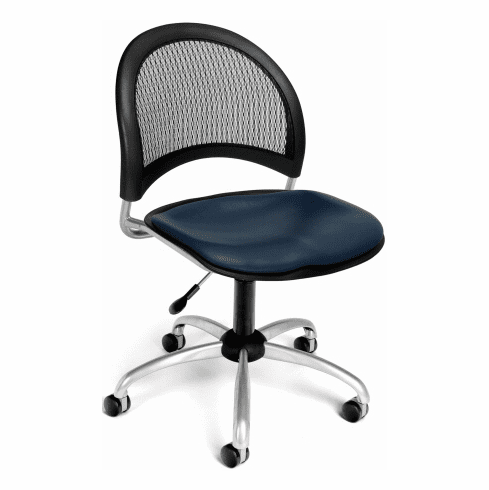 This contemporary mesh back office chair from OFM features an ergonomically contoured triple curve seat upholstered in durable, easy care vinyl. Other features include screen mesh on backrest for maximum support and ventilation, your choice of (5) different vinyl colors, 360-degree swivel, pneumatic seat height adjustment and a five star angled spider base with dual wheel carpet casters. Optional height adjustable arms available. Meets or exceeds ANSI/BIFMA standards. Dimensions: Seat Size: 18.5"W x 17.5"D. Back Size: 19"W x 15.5"H. Seat Height Adjustment: 18" - 22"H. Overall: 34.5" - 38"H x 22"W x 22.5"D. Weight: 35 lbs. Limited lifetime warranty from OFM.